For installing tankless water heater you may require some basic plumbing things like PVC pipes or PVC pipes, hammer, drill machine, and nails. Make sure that you have checked all the contents which are written outside the packaging box are present in it.Now follow the below steps to install your electric tankless water heater. · Firstly you should find an appropriate place to mount your heater, basically many mechanics mount it vertically to the wall with inlet and outlet pipes at the bottom. · Now make the holes on the wall with the help of drill machine to hang the heater or we can say to mount the heater on the wall. · Now after mounting the heater on the wall vertically make sure that the inlet and outlet pipes of the heater are in the bottom of the unit. · Now wrap the inlet and outlet pipes of a heater with Teflon tape so that there should no water leakage. 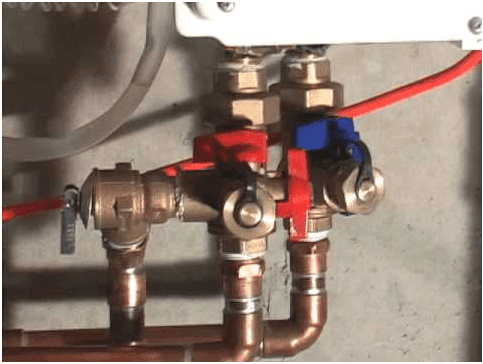 · Now take any PVC pipe and connect its one end to the inlet pipe of the heater and another one to any tap from where the cold water should flow to the heater. · Take another piece of PVC pipe and connect its one end to the outlet pipe of the heater and another end to any tap or shower from where you want to get hot water. · Now Open the front panel of the heater with the help of screw driver and connect the wires to the power supply. Always make tight and neat connections, improper contact of the wires to the power supply can cause electrical failure. · Now close the front panel of the heater and switch on the power supply button.After the unit is turned on, a beeping sound can be heard and an LED lights up. Note - Do not connect power wires to power supply until the plumbing connections are made. Looking for reviews of some good tankless water heater then you can read here. ==> Fixing of basic issues. So we're going to take a close look at a tankless water heater. I'm going to show you how to troubleshoot your tankless water heater or fix your water heater if you are experiencing issues in your heater. Basically, all the heaters are made of the same mechanism and with same circuit theory so fixes can be applied to any heater. 1. If you are not getting hot water instantly. · No hot water instantly is one of the common tankless water heater problems. Firstly you should check the power supply, water and gas supply to water heater. May you have set the temperature very low so check the temperature and if still, the problem resists replacing the heating elements. 2. Water is too hot. · Check the temperature may it is set too high.Try reducing the temperature. · Clean the water pipes may the water flow is very low. 3. The heater is making noise. · Check the cooling fan, clean it. · May be due to low air pressure, try opening windows. We found Bradford white water heater requires very low maintenance compared to others. Many Heater problems are associated with water flow rate so always keep the constant water supply to the heater while taking shower or doing other work.So these were some of the basic errors you can fix at home and these above steps will also help you to maintain your tankless water heater.